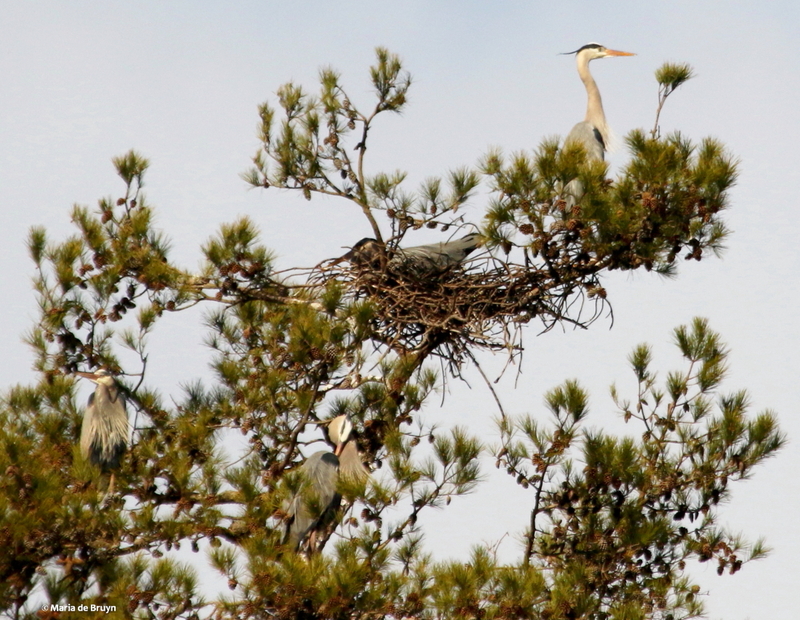 Unlike Eastern bluebirds (Sialia sialis) and other songbirds, great blue herons (Ardea herodias) like to build their nests near one another, forming what is called a rookery, or colony of nests. 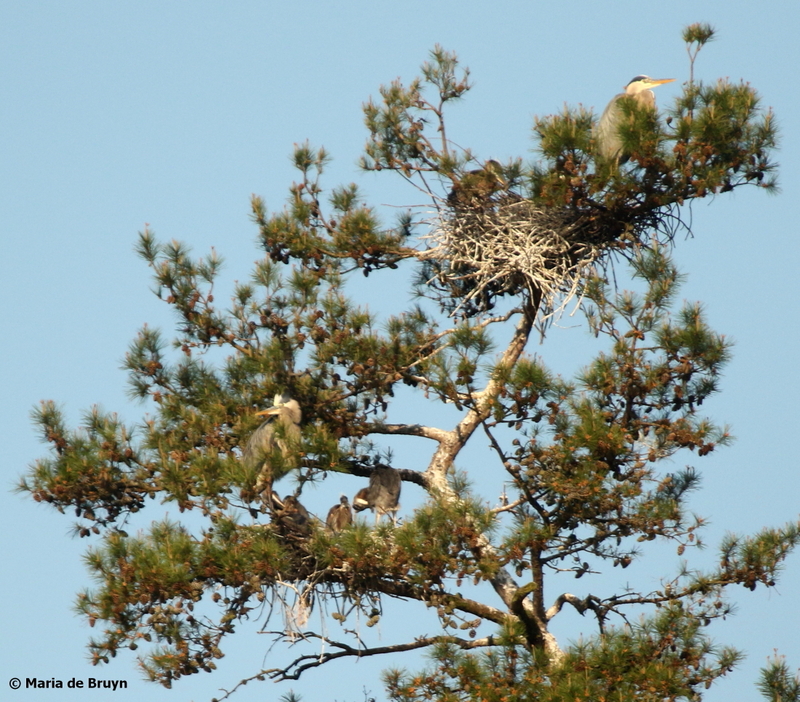 The nests are often seen in the tops of tall trees and comprise large twigs and branches that surround grass, leaves and moss. 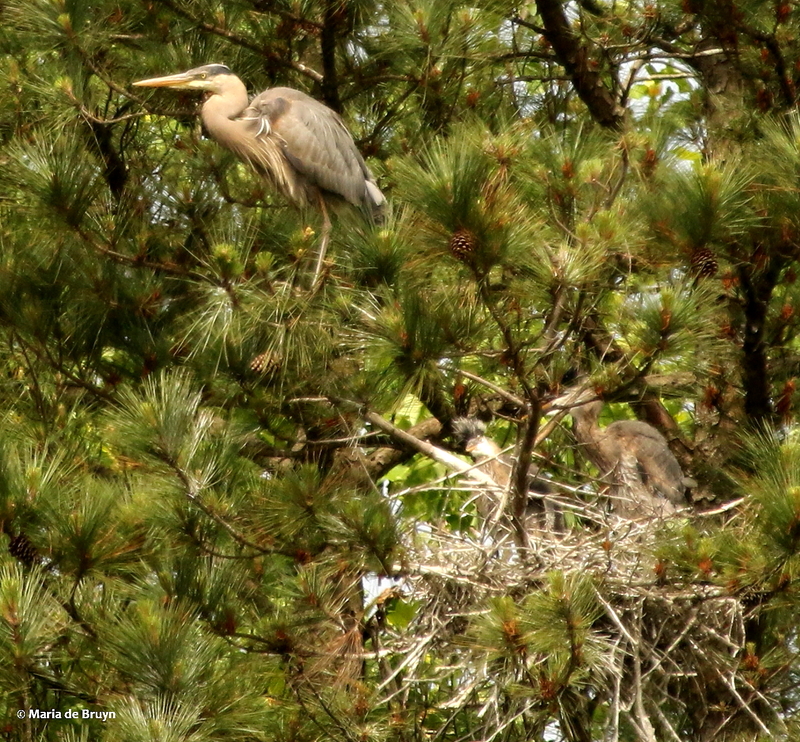 As many as 135 nests have been counted in a rookery, but the one at Sandy Creek Park that I visited this spring had three nests. 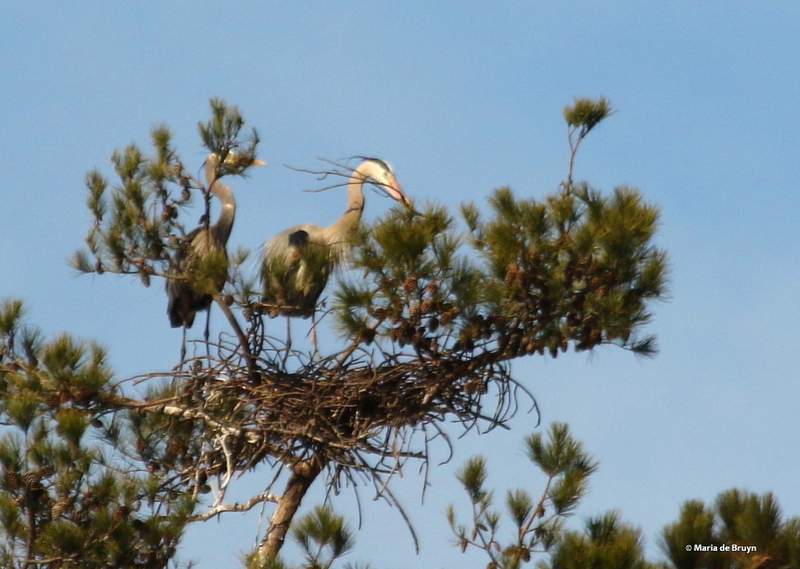 The herons return to the nests for several years running. 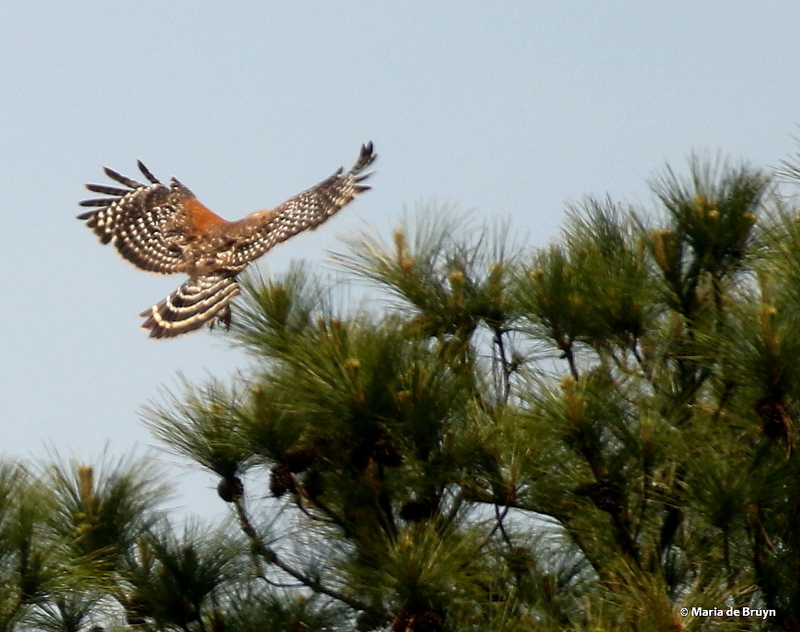 Each year, the males re-furbish the nests in order to attract a mate. 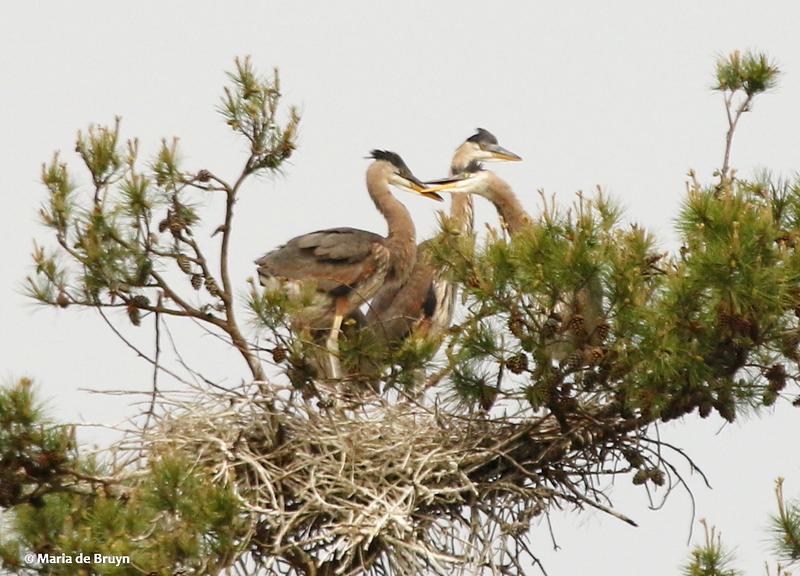 You can see the nests well with binoculars from a walking path, but as I have no binoculars and rely on my camera’s zoom lens, I slogged through forest and marshy terrain on numerous occasions to get close to the pond that had their rookery pine trees on the other side. They were still a bit out of range for my lens, but occasionally I managed to get a half-way decent shot, which encouraged me to return often to follow the nestlings’ progress.I followed them from 8 March through 26 June. 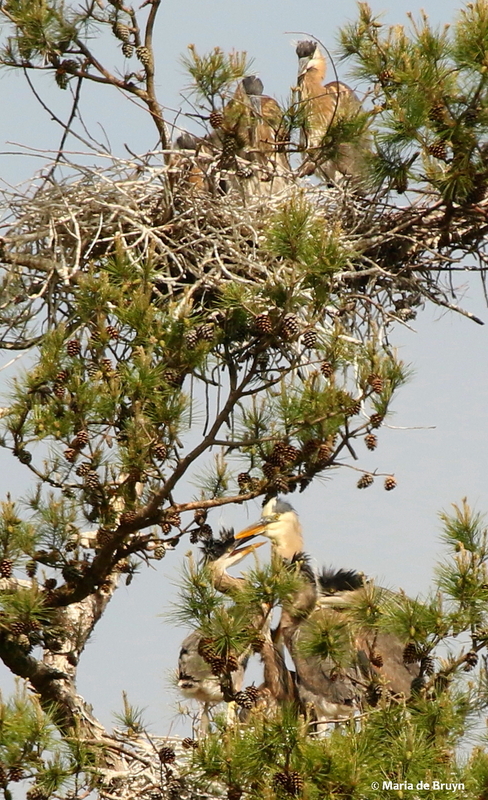 The top nest in an open-to-the sky tree appeared to have four babies, while the nest below it had three. 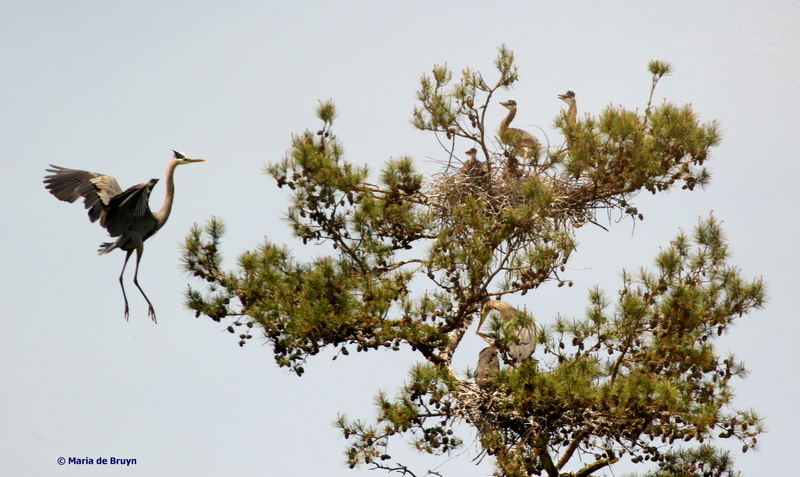 A nest in a tree to the right, which had much more dense foliage, seemed to be occupied by only one or two babies. 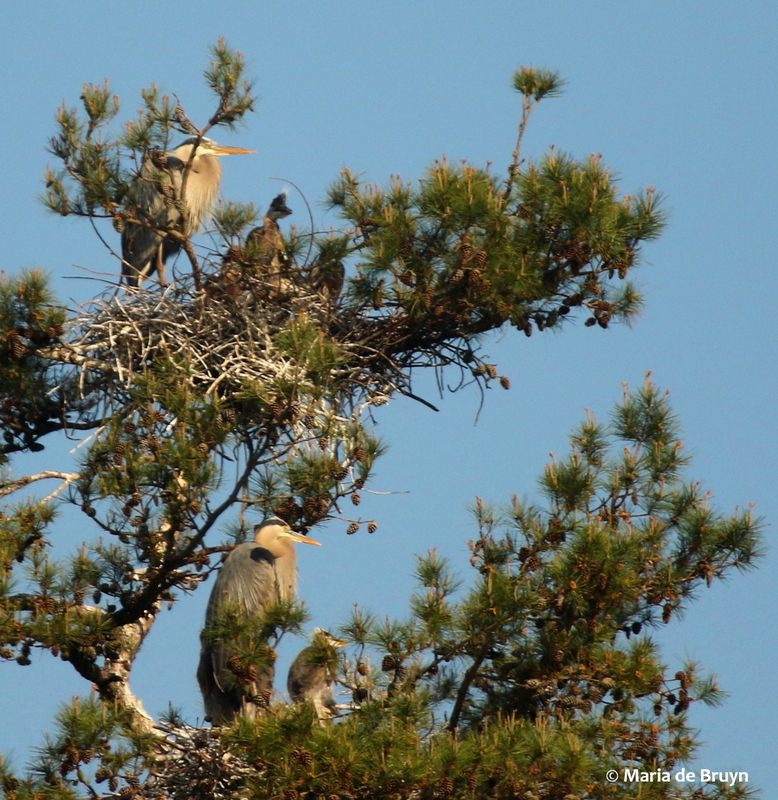 There were always 1-4 adults around, including both parents on the nest and “guards”, who took up posts atop nearby trees to watch the nearby skies. 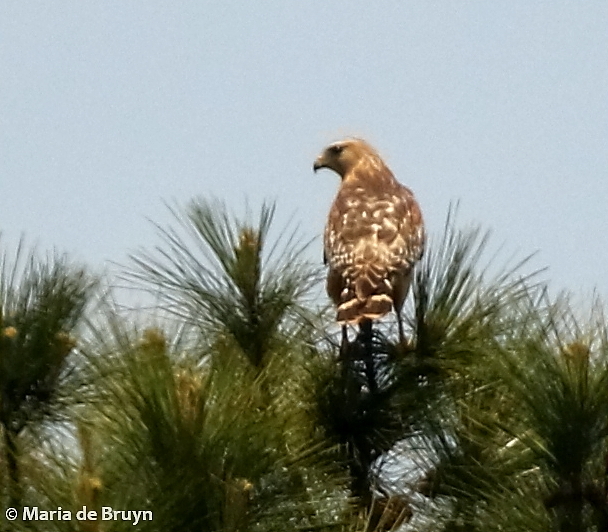 This is one reason for the rookeries; the herons want to ensure that there are adults around to protect the nestlings from predators, which include raccoons, crows and hawks, such as this red-shouldered hawk (Buteo lineatus) that was hanging around the nests one day. The parents feed their young by regurgitating food and the young birds get excited when a parent returns after being away for a time. 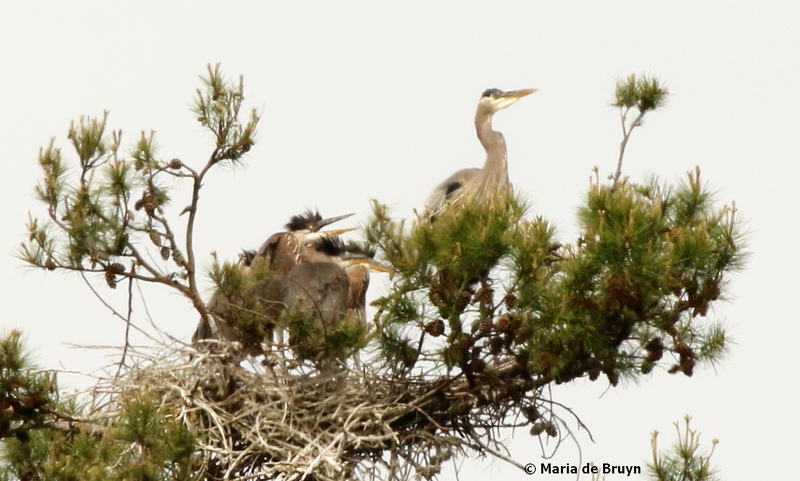 The nestlings make quite a lot of noise squawking loudly while they jostle to get first in line for the meal. 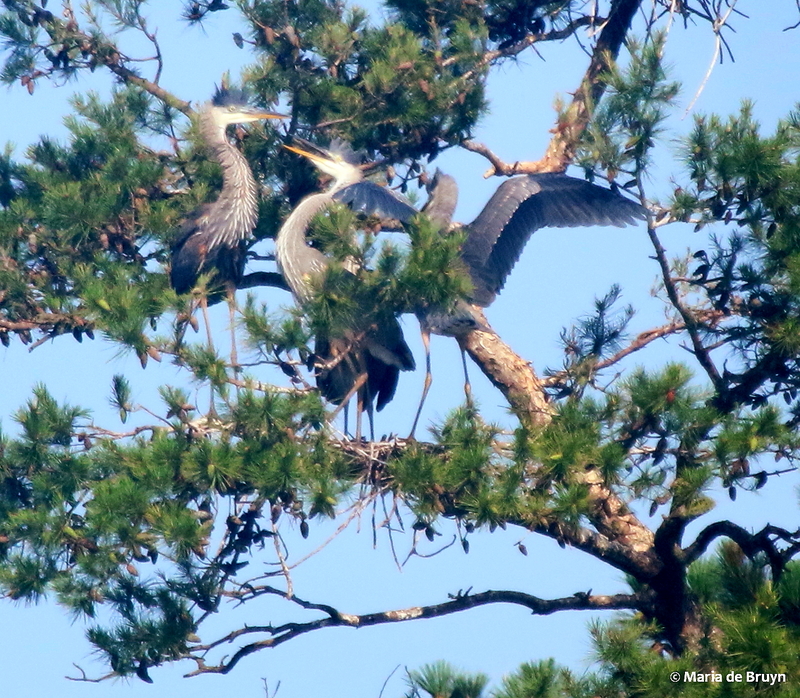 The young herons appear to “argue” with one another with loud calls and it seemed that they “jousted” with one another using their beaks. 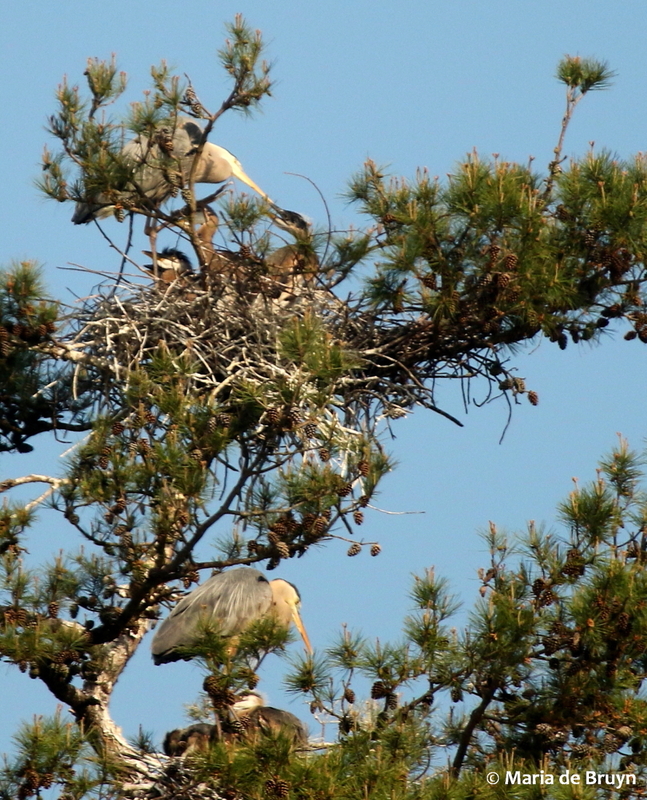 Weaker chicks may miss out on getting enough food and can die of starvation, but that didn’t happen at the Sandy Creek rookery. Some chicks were obviously larger and stronger than others, but even the smallest fledglings survived.As they grew, the babies began standing tall and walking around the nest. 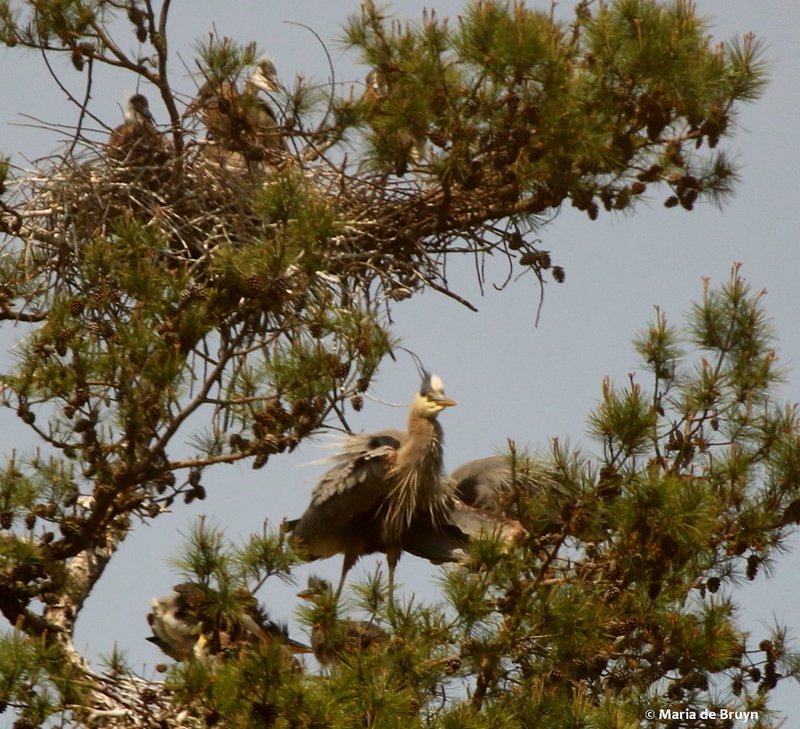 When they were close to fledging, they stood near the edge of the nest and practiced spreading and flapping their wings. Sixty days after hatching (much longer than smaller birds! 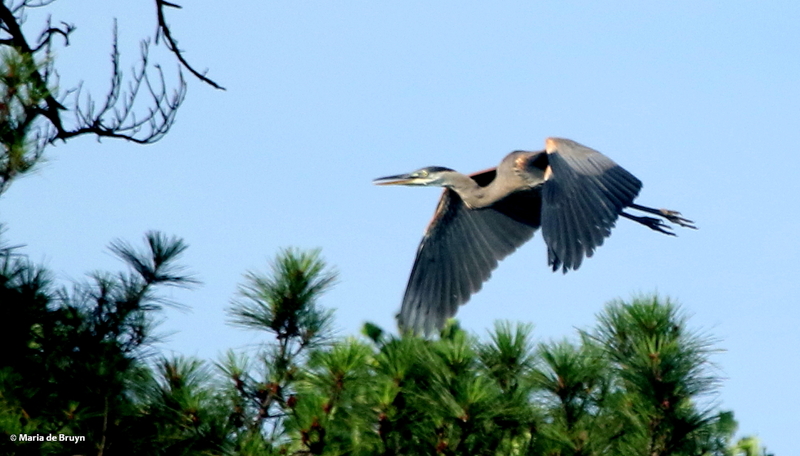 ), the young herons were ready to fly and began taking short flights to nearby trees, before venturing out on farther trips. The young ones will not breed until they are two years old. 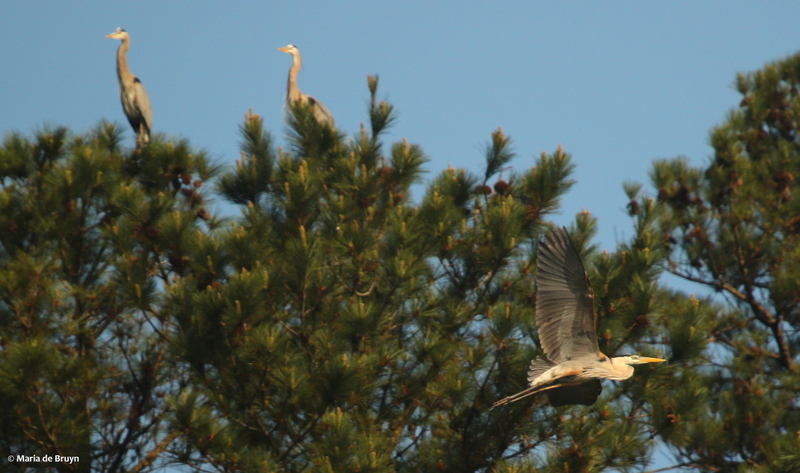 Watching events unfold at the rookery was a new past-time for me this year and likely one I’ll repeat in the future. If you have time and the opportunity, I’d recommend the experience!